Despite political foes, professional jealousies, and the scandal which drove her into exile, Capt. Honor Harrington has been offered a chance to reclaim her career as an officer of the Royal Manticoran Navy. But there's a catch. 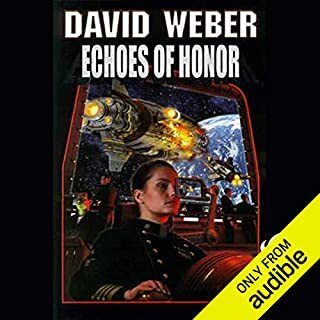 She must assume command of a "squadron" of jury-rigged armed merchantmen with crew drawn from the dregs of her service and somehow stop the pirates who have taken advantage of the Havenite War to plunder the Star Kingdom's commerce. Honor Harrington has survived ship-to-ship combat, assassins, political vendettas, and duels. But this time, Honor and her crew, ambushed and captured, are aboard an enemy ship, bound for a prison planet aptly named "Hell" - and her scheduled execution. Yet the one lesson Honor has never learned is how to give up. She and her people are going home--even if it means conquering hell to get there! No one wanted another war. Thomas Theisman didn't. Not after risking his life to overthrow the Committee of Public Safety's reign of terror and restore the Republic of Haven's ancient Constitution. Baron High Ridge didn't. The Prime Minister of Manticore was perfectly happy with the war he had. No one was shooting anyone else at the moment, and his government could continue to milk all those "hostilities only" tax measures for their own partisan projects. It's hard to give peace a chance when the other side regards conquest as the only option and a sneak attack as the best means to that end. That's why the Kingdom of Manticore needs allies against the Republic of Haven, and the planet Grayson is strategically situated to make a very good ally indeed. But Her Majesty’s Foreign Office overlooked a “minor cultural difference” when they chose Honor Harrington to carry the flag: women on the planet of Grayson are without rank or rights and Honor’s mere presence is an intolerable affront to every male on the planet. At first Honor doesn’t take it personally. But, in time, such treatment becomes taxing and she makes plans to withdraw until Grayson’s fratricidal sister planet attacks without warning. Now, Honor must stay and prevail, not just for her honor, but for her sovereign’s, for the honor of the Queen. rather enjoy the story as it is progressing. what happens next? a joy for the next book. The second book in the series introduces the planet Grayson, and its misogynistic people. But not as misogynistic as the Masadans! Honor once again saves the day, several times, and manages to make some powerful enemies as well as some good friends. 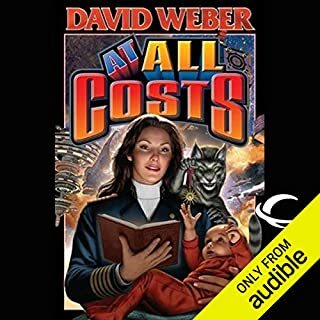 The narrator did an excellent job, even with all the different characters she has to voice. STORY - This story has such an exciting, dangerous, complicated plot, I hate to criticize it. There are many characters with ulterior motives that make things interesting and keep the plot twisting. But there are two really big problems, IMHO, with this book. First, Honor is so honorable, brave and perfect that she's not "human." There's not anything specifically to dislike about her but there's also nothing to really make you care about her either. Second, there is way too much information about interplanetary politics, ship capabilities, speeds, weaponry, etc. Yes, that's what makes this type of story interesting, but I became bored as it drug on and on multiple times in the book. You will have to keep many characters and their motivations straight. This is not an easy listen. There are also some pretty bad things which happen in this book to Honor and many of her crew. The last two hours are very, very tense and the ending is emotional. 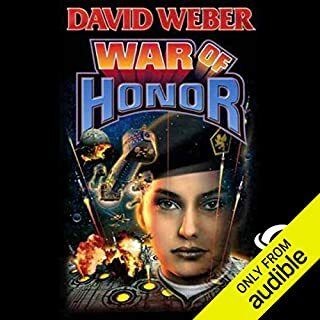 If I had been more emotionally involved with Honor, I'm sure I would have cried. (But you may chuckle every time they talk about a pennis, which is like a shuttle, but then my mind may just be in the gutter). 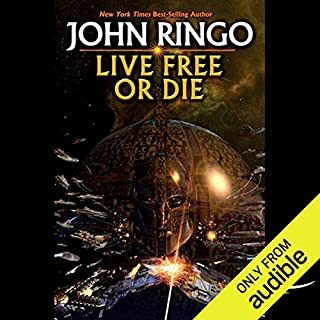 I listened to Book 1 and now Book 2. 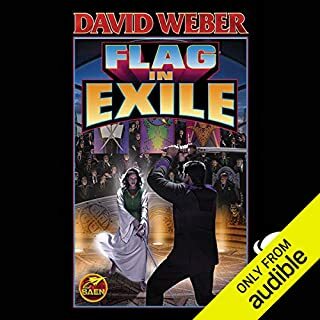 They don't need to be heard in order, but there is mention of some events and characters from Book 1 in this book. 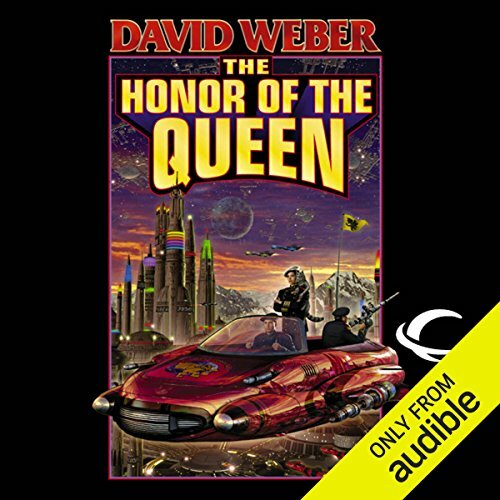 PERFORMANCE - She does a pretty good job with Honor's "soprano" voice, as it's called multiple times in the story, as well as male voices and a few accents. Overall, though, I didn't really care for her basic reading style. 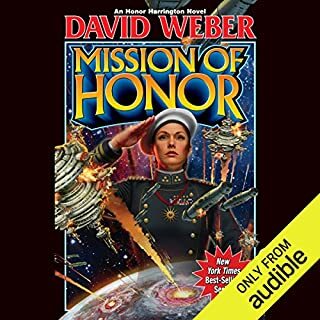 This book is about a dangerous military mission, and she sounds like she's reading a classic novel. I think a different reader, perhaps even male, would have been much better. 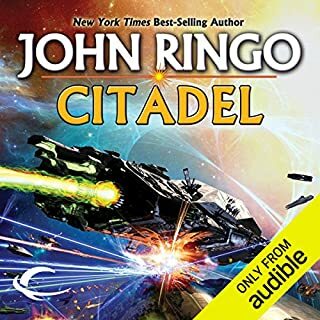 OVERALL - Recommended for men and women who enjoy interplanetary politics and battles. Not for children. This book expands HHU, New characters, new planets, some politics. 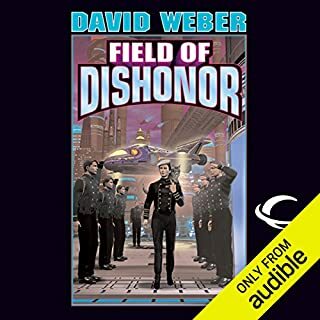 I consider this book to be a page out of feudal Japan history, this book also lays the principal blocks for the future grandiose actions and plots,it helps to move beyond just space battles. 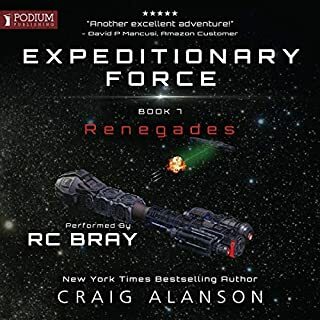 Old "Fearless" will be scuttled, Honor receives a new ship just out of docks, She accompanies a diplomatic mission to Yeltsin star, where she encounters religiously conservative, sexist world Grayson, assassination plots and human cruelty. There are lots negative reviews of Allyson Johnson's narration, Despite what people say I think she is a perfect fit. She uses enough different voices and tones, that you can easily separate and identify any of the characters, her way of reading is unobtrusive, you don't get any of readers personal feelings on the subject, so you have freedom to make your own decision. People of Grayson please meet Honor Harrington! Once I started to read the series, now I feel obligated to reread the whole series in English. This book is very important in the series as Honor gets introduced to the Graysons for the first time and vice versa. 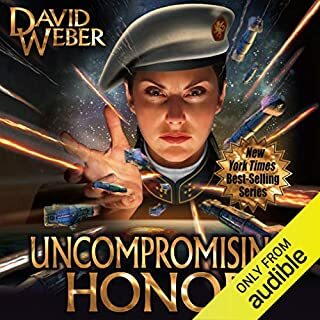 The way the misogynist society perceives women in military as an abomination and then how they start to grudgingly accept Honor was interesting. On the other side the abuse her crew suffer in the prison camp is just horrible and it almost made me cry listening to it. The narrator was just that good. 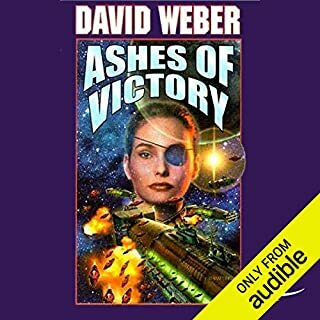 The number of people dying is horrific as with any kind of military war stories but still the series is very entertaining and I am looking foward to rereading and read the more recent ones for the first time too. Story is pretty decent, but need to get past the reader. There are a couple specific things about the reader I don't like. First, she's not so much monotone, but stilted throughout. Second, she seems to pick random accent amalgams for every other character and it's just distracting. It's usually somewhere between Russian stereotype and French stereotype. 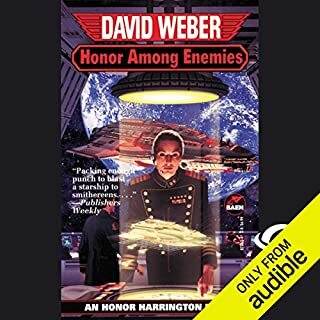 The plot is very much like the first book, wherein Haven seeks to dupe Manticore to gain advantage for the upcoming war and Honor manages to thwart them. It was okay and there was an exciting part where Honor and her tree cat get to show some martial arts skills. The only thing that bugged me was the narrator failing to express the appropriate emotions. It was mostly jarring because the writing kept saying that someone's voice was cold or angry or sad and then the narrator read their part exactly like every other time. Anyway, if you liked the first one this is more of the same. 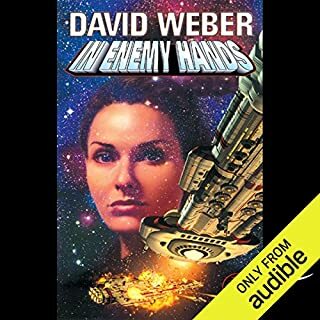 I loved this series when I first read it, and am enjoying a second time on audio. 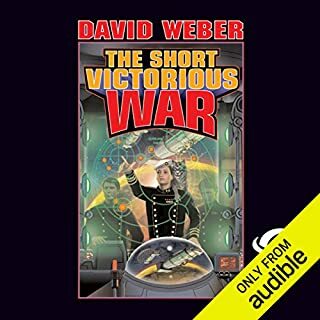 Another great piece of work by David Weber with all the space battles, politics, and theoretical physics you could want. 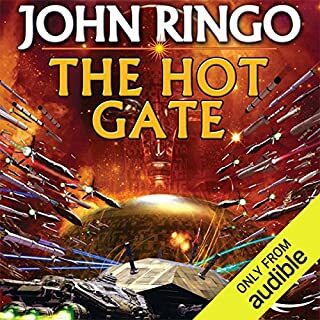 The narrator does an excellent job of voicing the characters as they are described in the books, particularly the main character's clipped feminine soprano. 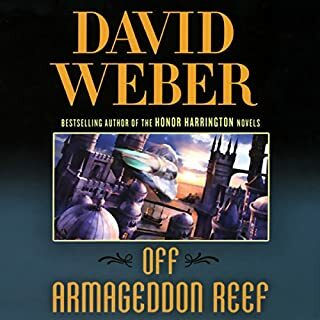 The narrator has also picked up on the fact that the Republic of Haven bears a great deal of resemblence to the French (their capitol is even named New Paris), and the Kingdom of Manticore to the British, and capitolized on it by giving the characters from each star nation the correct accents. This really helps highlight when the story has changed viewpoints and makes for a more interesting narration. 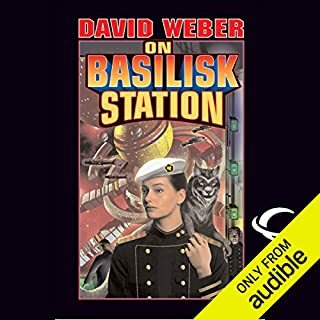 I've read all of the series over the years, and listened to two Audible versions. 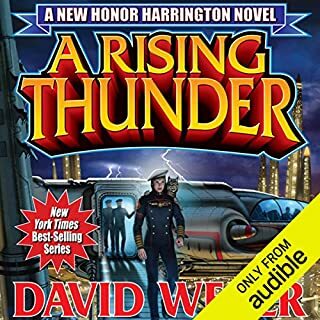 If you are new to the series, and don't want to start with the first chronologically in the life to the heroine, Honor Harrington, then I suggest you start here. The later books get a little wordy and could have used better editing. By contrast, the here the character is developed well and the action scenes come along at a tolerable pace. One of the things I like most about Honor is that she is a strong, self-possessed person. That comes throught well here.